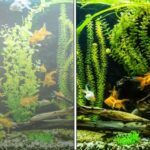 Water aeration is among the most beautiful features of an aquarium, but it is rarely considered whether an aquarium needs an air pump or not. 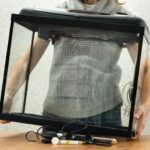 Does your fish tank really need those tiny air bubbles? Can you go without aeration, and can too much aeration do harm? Let’s find out! The short answer is that aeration is not mandatory in most cases and is not bad in most cases either. In most cases. To find out what the other cases are, let’s first clarify what aeration is, and what those tiny bubbles in the fish tank are good for. As you might expect, they have something to do with an oxygen, which is what fish use for “breathing” though their lungs. To be more specific, fish need water that has enough dissolved oxygen, and bubbles are one of the ways to increase this. Note: do not confuse dissolved oxygen in water with the oxygen that is a part of the water molecule H2O. The latter is unavailable to fish for breathing, but the actual gas O2 that is dissolved in the water is what fish need. How does oxygen get into the water? It does so from the room air at the water’s surface. The problem is that when the water of the fish tank stands still, the oxygen that enters the water is slow to move away and does not let many other oxygen molecules dissolve in the water. To overcome this, you need to stir things up a bit. An aerator makes tiny air bubbles that instantly float up to the surface and explode upon reaching it, making a physical force on the surrounding water and oxygen molecules. In turn, water starts to move and gets stirred. Therefore, in short, aeration is a tool to mix aquarium water, so the dissolved oxygen gets spread evenly throughout the volume of the tank and the surface can absorb more oxygen from the air. As you now see, aeration is not mandatory if your fish tank already has good water circulation and enough dissolved oxygen. But how do you know? How can you tell if your aquarium water has too little dissolved oxygen? The surest way to tell is to test it. 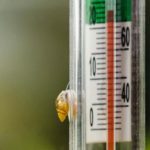 It is possible to buy aquarium testing kits in pet stores for all kinds of measurements, and dissolved oxygen is one of them. You can also take a look at how your fish behave. Signs of too little oxygen are low activity, gulping for air at the surface and rapid movement of gills. Solve underlying problems. 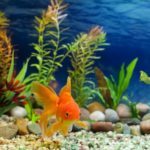 The most common cause of low oxygen levels in aquariums is having too many fish (that is, too many consumers of the oxygen), and too high water temperature (warmer water can hold less oxygen). In either of these cases, you can add as many air pumps as you want — it still won’t solve the problem. Powered aquarium filters provide enough water circulation to ensure there is enough dissolved oxygen in the water. Besides, many internal aquarium filters have an option to turn on or off generation of small air bubbles coming out of the outlet nozzle, thus further improving the mixing of the water. Live aquarium plants, just like any other plants “make” oxygen, too. They take dissolved carbon dioxide out of the water and turn it into oxygen. In fact, if you have live plants in your aquarium, you have to be careful and monitor their well-being if you choose to have an aerator for aesthetic purposes, because aerators also let carbon dioxide (which plants need for food) escape from the water. Air bubbles, of course, also increase water circulation, but today it is wiser to see them as an aesthetic tool that looks cool. Air pump – We suggest not going for cheaper devices. 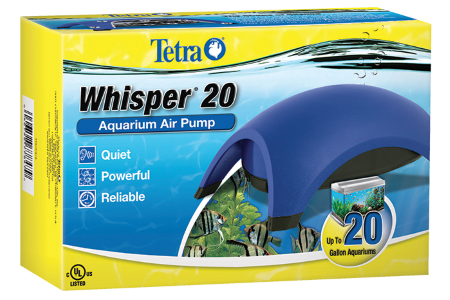 Air pumps can be the loudest pieces of aquarium equipment, and so you want to get a quality pump that is silent. Air tubes – Plastic tubes that run from the outlet of the air pump to the fish tank. These are usually flexible and come in many different colors. Air stone – A porous stone to which a tube is attached. 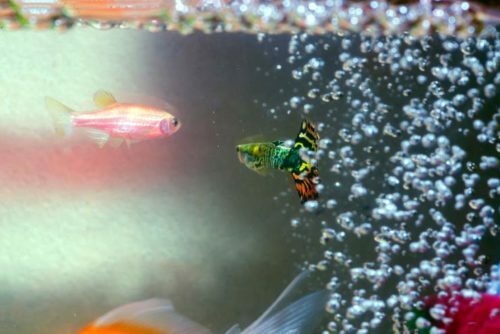 If you put an end of the tube inside the fish tank, it will create only a few large bubbles, which looks more messy than beautiful. The porous material of an air stone separates the air flow into many parts and creates thousands of tiny, beautiful air bubbles. Stones come in different shapes: some are round, while others are elongated, allowing the bubbles to be spread across a larger area. This choice is just a matter of design. Do you want a small source of bubbles in one corner, or a wall of bubbles at the back of the tank? It’s up to you. Regulator valve – Unless the output of the pump can be regulated on the device, you want to place the valve inside the line from the pump to the air stone to modify the air flow. If you notice that the bubbles create a storm inside the aquarium, you’ll be able to turn it down a bit. Check valve – A valve that lets air and water move only one way. When the pump is off, the water is able to flow backwards into the tube, which can reach the pump and damage it or flood your living room, unless you have a check valve installed in the chain. Alternatively, you can place the air pump above the water’s surface, but this can be impractical if you want the equipment to be hidden from view. Plug-in timer – You can turn the pump on and off manually, but it is much easier to have a timer. A plug-in timer not only frees you from this responsibility, but also ensures that the bubbles are on for the necessary amount of time. In the beginning, we recommend turning it on for only a few hours each day, and if the plants respond well, you can then increase the time. As we have said above, most aquariums, especially if they contain live plants or powered filters, will do fine without an air pump; however, many find air pumps to be one of the most beautiful aspects of keeping fish. Thus, they can be implemented at will.